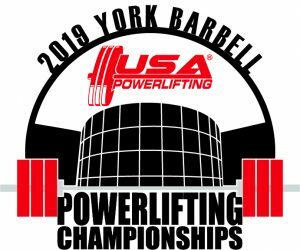 York Powerlifting Championships AND Raw National Qualifier on June 8th 2019. The IPA will be running it’s National Championships on November 17th-18th. 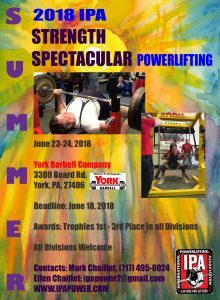 The IPA will be running it’s annual Strength Spectacular on June 23rd-24th. East Coast Gold will be running a USAW sanctioned Olympic Weightlifting competition on April 14th and 15th hosted at York Barbell. 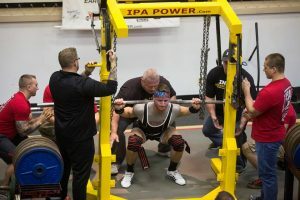 This well-established competition is a great opportunity to compete against many of the top lifters in the region and for novices (participated in two or fewer meets) to get meet experience. 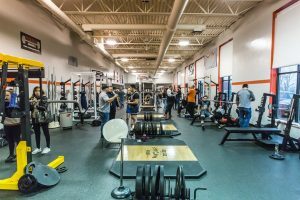 The IPA will be running its annual State Championship on March 4th and 5th at York Barbell’s historical Weightlifting Hall of Fame. York Barbell was pleased to be the location of the IPA’S National Championship this past November. 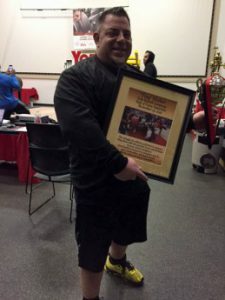 In conjunction with the championships, World Renounced Power Lifter Tiny Meeker was inducted into the York Barbell Hall of Fame. 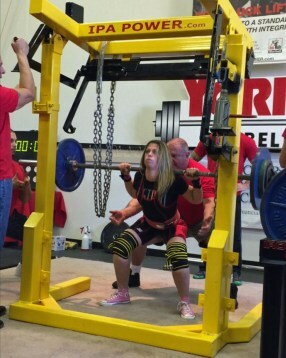 Shannon Hightman won the Best Lifter Award in the Raw Amateur Women’s Open Division. Tiny Meeker poses with his York Barbell Powerlifting Hall of Fame Award after being inducted November 20, 2016. Tiny also guest benched and broke the SHW Pro Equipped Men’s Open Division bench press record with a 915 lb. bench. For more information about this event, please visit IPAPower.com or view the results. *York Barbell does not sanction or run competitions. 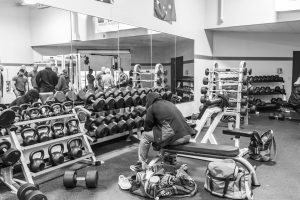 York Barbell is solely a host location providing its facilities to the pursuit of competition in strength and fitness. 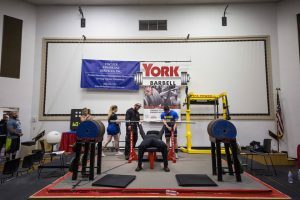 Sanctioning organizations are required by York Barbell to adhere to amateur competitions and administer or be subject to drug testing by sanctioning bodies.